Cream together butter and sugar then add the vanilla. Add the flour and milk, alternating, starting and finishing with the flour. Add the chocolate chips. Shape the dough into bite size (or 2 bites size) rounds and place on a cookie sheet for a few hours, allowing to become hard. Melt the chocolate you will be using to cover the dough either in the microwave or in a dish over a pot of simmering water. Plunk the cold dough balls into the chocolate, covering completely and lift out using a spoon. 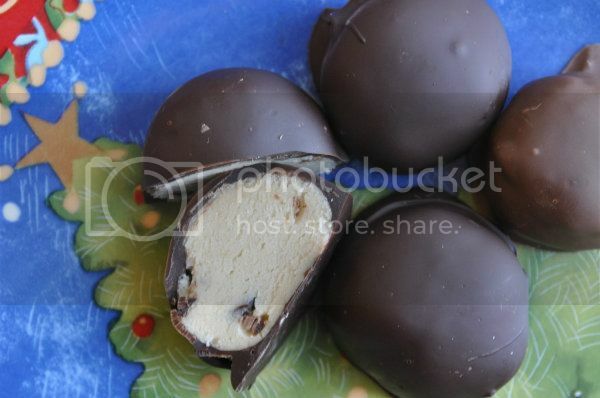 Tap the spoon 4-5 times on the edge of the dish, allowing the excess chocolate to drip off then gently plop the chocolate covered balls onto parchment paper and allow to harden, either on the counter or in the fridge.